I take care of patients with a wide variety of lifestyles, backgrounds, ages, challenges and careers. One of my rather humorous patients, who also happens to be a physician, asked me “How do I get summer sleek, stat?” Pretty funny, and here in New England we want to make the most of every summer minute, whether we want to hike the White Mountains, kayak the cool lakes, swim in the brisk ocean, our just relax on the beach! We want to be fit and “sleek”, and healthy at the same time. We want to not only get on track quickly, we also want to set ourselves up for long term success. http://link.springer.com/article/10.1007/s12529-010-9092-y “Fast weight losers obtained greater weight reduction and long-term maintenance, and were not more susceptible to weight regain than gradual weight losers." Dr. Yoni Freedhoff: "The term I coined to describe it is "best weight," where your best weight is whatever weight you reach when you're living the healthiest life that you actually enjoy...If you want to succeed with long-term weight loss, it's crucial that you embrace both reality and imperfection." http://www.vox.com/2016/5/10/11649210/biggest-loser-weight-loss"
When paired with exercise which meets your fitness and health needs, plus lifestyle strategies, healthy sleep, stress management, and something called “CBT” (cognitive behavioral therapy) techniques, you really can become “summer sleek stat” - and stay sleek year round! If you are “wired” to feel a strong desire to eat when faced with tempting, tasty food, you face a real challenge in our modern world, where we are bombarded with “addictive foods” everywhere - on tv, at gas stations, shopping centers, at work, sometimes at school - and sometimes even in our own homes! Research has shown that certain foods can create an “addictive response” in the brain chemistry - and this response can happen by simply SEEING the foods, or thinking about them - even if we dont’ eat them! Our modern world is the “perfect storm” to lead to excess weight gain and poor health. Researchers call the modern environment “obesogenic” - it leads to excess eating of foods high in fat, carbs, and dense in calories, that can create inflammation throughout our bodies, and our appetite centers in our brains (causing them to malfunction, and not register “fullness” appropriately.) Inflammation is tied to metabolic syndrome, belly fat gain, prediabetes, diabetes, cancer risk, and more health risk. Some of us have inherited genes (and have had these genes activated, sometimes even before we are born) which create an extremely strong neurologic reaction - a powerful biological urge - to eat these hyperpalatable foods, while other people simply do not have the same brain response. Those who aren’t wired this way do not have the same cravings, or the same “drive” to eat fatty/carby/starchy/sweet foods. Neurologically they have it easy - they don’t experience the same “urge” to eat in excess. They can walk right past a box of donuts and not really care whether they pick one up or not. And if they do decide to pick on up, they can easily “stop at one bite”, almost effortlessly. And here is the frustrating thing - trying to explain what cravings feel like, to those who don’t have them, is like trying to explain “color” to someone who is colorblind! They just don’t “get” it. I suppose we can’t really blame them, though, can we? It is hard for anyone to understand what someone else is experiencing (empathy is tough!) It’s not their fault - or their willpower - that allows them to easily control their eating. It’s just neurobiology (and a new field of science called “epigenetics”.) But here is the thing - we don’t have to blame them, but we do have to “protect ourselves” from well-intentioned - but misguided and uneducated - comments and actions that can sabotage our efforts to eat and live healthfully. When they are critical and offer “helpful advice”, they generally “don’t know what they don’t know.” When they say silly things like “you should be able to keep ice cream in the house, but just don’t eat it”, or “you can eat a piece of coffee cake, just stop at one small piece”, you need to recognize that they don’t understand the biology, the neurochemistry - or the psychology behind what they are saying. Never feel guilty for being wired to love food. It is what it is, as they say, and the good news is that we can control our cravings and food drive by setting up our lives so they are not constantly seeing/smelling/thinking about hyperpalatable food. And more good news - even if we can’t completely create a healthy environment, can’t remove all addictive food triggers, there are still things we can do to make our world a “safer, easier place” to be healthy! And sometimes we can even educate those around us, so they can help, rather than harm, our efforts to be healthy. Family, friends, co-workers and others can inadvertently sabotage your success by bringing trigger foods into your environment. If they don’t have the “wiring” to eat addictive foods in excess, they often don’t understand how much they are contributing to the problem. They don’t understand the biology, the neurochemistry, and since they don’t feel the addictive response/cravings themselves, they can have a hard time understanding what it feels like in others. Even parents can accidently set their children up to “fail”, when they do not understand that they have to remove “addictive food” from the home. Parents (and others) can help contribute to success by removing triggers, and replacing them with healthy, tasty, simple options. Human nature is such that we will naturally “go to” what is easiest, tastiest, and most fun. Rather than fight human nature, we have to honor and accept it - and set our lives (and homes) up for success. We need to make the HEALTHY options the EASY options, in order to succeed! We need to make the UNHEALTHY options less available - out of sight, out of mouth, as they say. They same goes for healthy activity. If you have to spend an hour getting ready for and driving to a gym, you are less likely to do it. You are more likely to do an activity when it is simple to get to, simple to do, kind of fun, and not stressful! If you would like help setting up your own personal environment so it is "safe for healthy living" - give us a call any time! Our goals are to help people establish simple, realistic, healthful lifestyles which make it easier to make healthy choices every day. 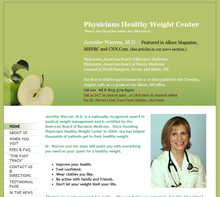 Read more about our program: healthyweightcenter.com Call any time: (603) 379-6500. Yale University, New Haven, Connecticut 06511, USA. body is healthy and strong; that hardy spirits and tough minds usually inhabit sound bodies. In this sense, physical fitness is the basis of all the activities of our society. And if our bodies grow soft and inactive, if we fail to encourage physical development and prowess, we will undermine our capacity for thought, for work and for the use of those skills vital to an expanding and complex America." The new research tested a program called ABC (Activity Bursts in the Classroom) for Fitness, a strategy which uses short, structured activity breaks throughout the school day, led by classroom teachers. The results are impressive: fitness improved in children's strength (upper body and core abdominal strength in particular.) Even more impressive - asthma and ADHD improved so much that medication use declined! So what exactly were they doing? From the article: "ABC for Fitness aims to provide fun and creative activities that are noncompetitive, age-appropriate, and gender-neutral to promote an interest in physical activity among children and increase their behavioral capacity.... The program was flexible; activity intensity could be raised or lowered according to the athletic abilities and attention spans of the students. The program was intended as a supplement to physical education programs. Ideally, the activity bursts added at least 30 minutes of daily physical activity." The sessions had three parts: 1) warmup with light aerobic activity such as walking, arm circles, stretching; 2) strength-building activities such as squats, lunges, dancing; 3) cool-down similar to the warmup, with lower intensity activity and stretches. Can short bursts of activity help adults as well? The answer is also yes! "43 percent of people who participated in bouts of 10 minutes or less of physical activity multiple times during the day — the so-called "active lifestyle" approach — met federal guidelines for being active... also they fared as well as people who exercised for longer stretches in key measures of health, such as C-reactive protein, blood pressure, HDL cholesterol, waist circumference and metabolic syndrome." Link to the reserch article: http://ajhpcontents.org/doi/abs/10.4278/ajhp.110916-QUAN-348 "THE SCIENCE OF LIFESTYLE CHANGE: Association Between Biologic Outcomes and Objectively Measured Physical Activity Accumulated in ≥10-Minute Bouts and <10-Minute Bouts". Of course exercise is just one component of health, and healthy weight control. You can read my prior blog on the 6 M's of Exercise: http://healthyweightcenter.blogspot.com/2015/02/the-6-ms-of-exercise-health-and-weight.html Healthy nutrition, and healthy lifestyle including quality sleep, stress management, and life planning and organizing (and SIMPLIFYING), are key components of a healthy, happy life. If you would like some help setting up a great routine - and some support and accountability to stay on track - call us any time: (603) 379-6500. Read more about our program at healthyweightcenter.com .